As the #1 trails state in the nation, Michigan’s showcase trail is the Iron Belle Trail. This trail is the centerpiece of Michigan’s Comprehensive Trail Plan. It crosses through 48 different counties and builds on the state’s 12,500 miles of outdoor recreation trails, including more rail-trail miles than any other. Since the vision for the Iron Belle Trail was announced in 2012, $68 million has gone toward a variety of projects to build connections along the trail, including more than $40 million in federal grants, $25 million in state grants and more than $3 million in local funds. The Iron Belle Trail encompasses two routes: from Ironwood in the western upper peninsula to Belle Isle in Detroit. 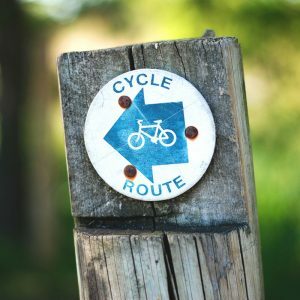 The biking route uses many of the state’s existing bike paths, bike lanes, and signed, designated biking routes as it travels up the east side of the state. The hiking route uses trails, sidewalks, and more than 1,000 miles of the North Country National Scenic Trail as it travels up the west side of the lower peninsula. The Michigan Fitness Foundation is home to the Iron Belle Trail Fund Campaign which is charged with raising funds to develop trail corridors and thus create a seamless, 2,019-mile trail.